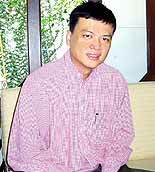 The 3 days international conference at the Sirindhorn Anthropological Centre (SAC) in Thonburi/Bangkok on December 18-20, 2003 was ceremonially opened by H.R.H. Princess Galyani Vadhana Krom Luang Naradhiwas Rajanagarindra in celebration of the auspicious occasion of her 80th birthday anniversary. H.R.H. 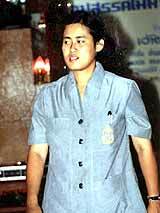 Princess Maha Chakri Sirindhorn presented the keynote lecture on the Buddhist concept of “parami”. H.R.H. Princess Maha Chakri Sirindhorn graciously consented to give the keynote lecture on the Buddhist concept of “parami” to correlate it in the Thai context to the superhuman power of the king and to the 10 royal perfect virtues and conducts. Under the 14 guest speakers, there were two foreign speakers from Chiang Mai. German National Dr. Hans Penth, Archive of Lan Na Inscriptions, Social Research Institute, Chiang Mai University, introduced the relatively unknown Phra Bua Khem Images in Lan Na that originated in Myanmar and have a lotus, a snail and a fish on the underside of the pedestal. Dr. Louis Gabaude, a member of the prestigious L’Ecole Francaise d’Extreme-Orient lectured on “dana” as a window on Thai Buddhist mentalities. By using French and Thai languages, he critically examined traditional merit-making practices and new types of gifts for true Buddhists in the modern world. Another highlight of the conference was a lecture by Thai historian Dr. Charnvit Kasetsiri which illuminated the journey of King Rama V to India in 1872 and the following reformations in Siam because of India. Also of high interest was the presentation of Dr. Paritta Chalermpow Konantakool, director of SAC, to survey community-based museums in Thai monasteries, where objects of offering, such as antiquities, curiosities and ethnic artifacts abound. Furthermore, American Dr. Donald K. Swearer, Swarthmore College, gave vivid interpretations on the presence of the Buddha in Northern Thailand in anticipating his forthcoming book project about the sacred geography of this special Buddha land. Almost at the end Dr. Michel Lorrillard from the Vientiane branch of the l’Ecole Francaise d’Extreme-Orient held a lecture to give the material evidence that the diffusion of Lao Buddhism went from Lan Na and rejecting the cultural influence of Cambodia. In the end, everybody agreed that the aim of the conference to show the original developments of Theravada Buddhism in Southeast Asia, from Arakan in the west to Cambodia in the east, was fully accomplished. All participants and some 500 visitors have to say thank you to H.E. Laurent Aublin, French ambassador in Bangkok, who privately paid for this hospitable conference. Khunying Khaisri Sri-Aroon, secretary of the Princess Maha Chakri Sirindhorn Foundation organized the event as perfect as possible. Hopefully, many more similar events will follow! Singapore and Thailand are close to an agreement to put armed air marshals on flights between the two countries. Singapore already has a similar deal with Australia. Other news in the region includes Singapore Airlines is creating commercial aviation history with a non-stop service between Singapore and Los Angeles commencing on February 3, 2004. Malaysian budget airline AirAsia has received permission to fly to Bangkok from January 15, 2004. AirAsia aims to have 22 planes by the end of next year, up from its current nine. Cathay Pacific has won the right to fly the trans-Atlantic London-New York route, making it possible to offer around-the-world connections. Virgin Atlantic has won the right to fly to Sydney from Hong Kong, allowing it to connect to its low cost airline, Virgin Blue. The Boeing 7E7 Dreamliner is due to enter service in 2008, replacing the 757 and 767 jets. The aircraft is designed to save on fuel and operating costs. One version will be able to fly 18 hours non-stop. Chiang Mai’s tourism related business revenues fell this year by a little over 4.5 percent, but in the New Year all hotels are claiming 80-95 percent occupancy rates. Vorapong Muchaotai, president of Thai Hotels Association (THA), Northern Chapter, said that a large growth in Chiang Mai tourism related businesses is expected next year. “With many international meetings scheduled to be hosted in Chiang Mai next year as well as a massive influx of tourists wishing to visit the two Chinese goodwill ambassadors, Chuang Chuang and Lin Hui, and with the expanding network of low cost airline services, I expect to see an enormous growth in our tourism business next year,” he said. THA Northern Chapter president added that 90-95 percent of city’s hotel rooms had been booked as well as 80-85 percent of resort hotel accommodation during the New Year holidays and confirmed there would be no extra service charges during the holidays. The big concern, he said, was the shortage of professional tourism staff and well-planned marketing and public relations strategies for the medium sized local hotels. Chiang Mai has plans for college courses for students who would like to come in to the world of tourism with courses designed to increase fluency in foreign languages, finance, cookery and management. Chiang Mai to be hub of consumerism? The Tourism Authority of Thailand, Northern Office, Region 1, will host the Chiang Mai Consumer Fair at Lanna Hall, Central Airport Plaza in the second week of February. Chalermsak Suranant, director of TAT, Northern Office, Region 1, said that he had planned to hold this fair at the end of January, but unfortunately he had to postpone due to two big events coming up. Chalermsak Suranant, TAT Northern Office Region 1 Director announces the Consumer Fair at Lanna Hall, Central Airport Plaza. “At the end of January, there will be the Chinese New Year celebrations and a week after that there will be the 3rd Chiang Mai Tropical & Ornamental Plants Festival, so we should not hold the fair against those two major events,” he added. The fair will have more than 150 booths, presenting all products from every region and Chiang Mai will emphasize its medical and health care hub strategy to promote spas as well as new travel routes to the ‘aviation hub’. To make Chiang Mai tourism gain in popularity, local tour agencies should come up with unique packages to attract tourists, not only presenting new products but trying to mingle old products with new products and presenting them in the most interesting way. TAT Northern Office Region 1 expects that more than 300,000 people would attend the fair, bringing approximately 300-400 millions baht circulating during the three days of the fair. Chalermsak said that he saw a successful future linking Chiang Mai with neighboring countries such as Burma, China and Laos, but there was no specific organization trying to make it happen right now.